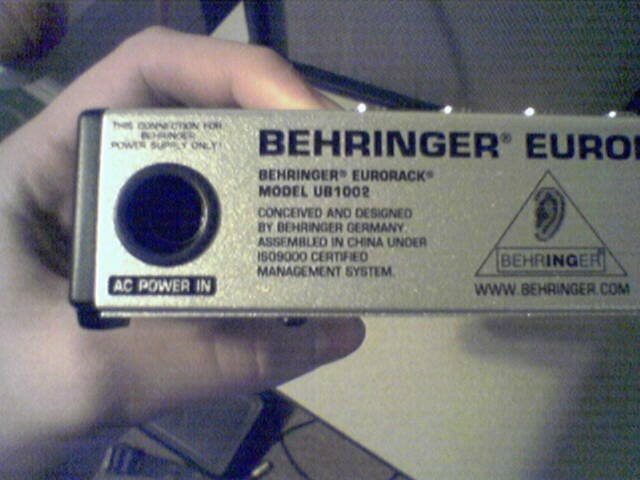 Impedance	 approx. 240O bal. /120O unbal. Type ¼” TS connector, unbal. 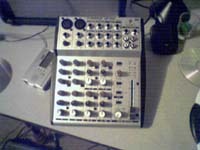 Ok, to start off with there are 10 inputs in total with two phantom powered Mic inputs. 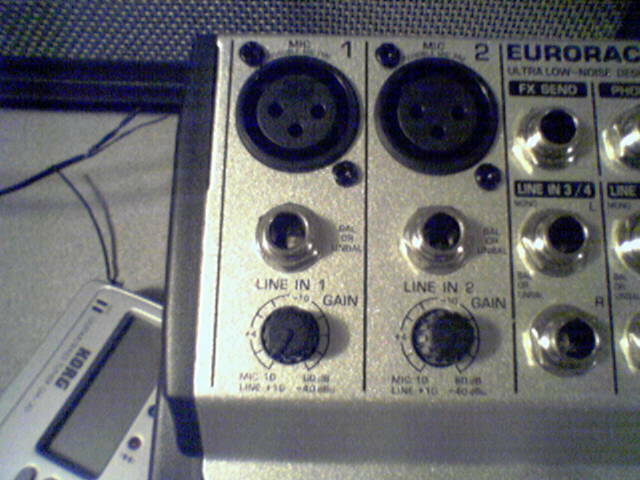 Both of these Mic inputs have very low distortion to them. I can’t tell you how many times distortion on either vocals or acoustics can kill a song or performance. I was first set on getting a separate Mic pre amp but I went with this instead (due to price) and I have been very happy with my decision. There are also quite a few features that allow you to pinpoint exactly what you want out of your sound which is always needed. There are two 3-band equalizers along with a low cut feature which I’ll get into later and also two gain controls on both of the mono channels (input lines 1 and 2). Then for each input there is a pan control and a FX control, which will also be discussed more. 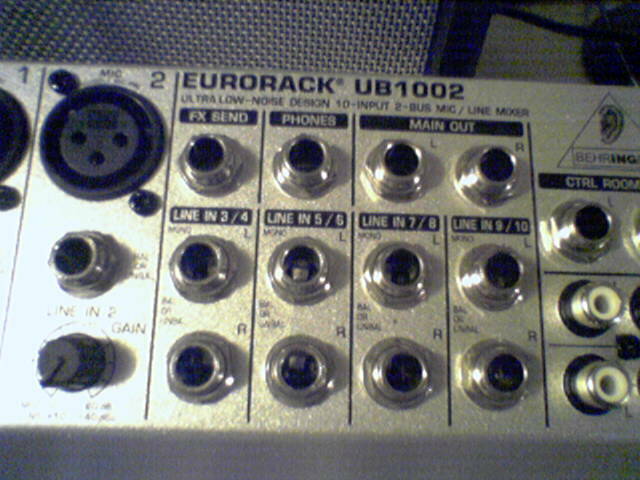 The UB1002 features five outputs, one called ‘FX send’, which really catches my eye. Aside from the ¼” inputs and outputs there is a tape in and tap!e out feature. 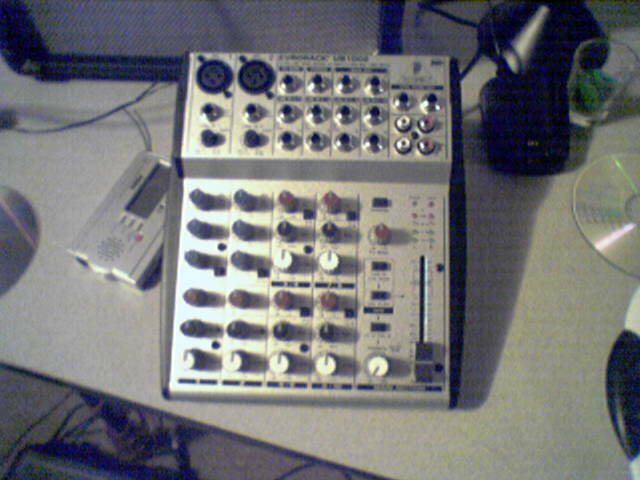 To control the levels on this unit is a rotary knob for headphone and control room volume and a fader for main mix volume control. 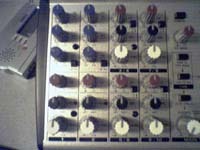 Right above the fader are ten LEDs. Eight of them (four on for each side) are level indicators, one is a power indicator, and the last is a phantom power indicator, which is labeled as +48V. 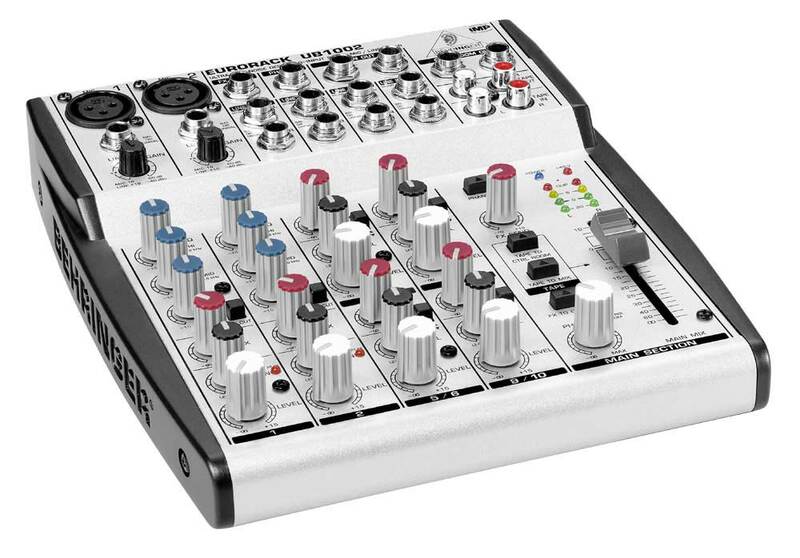 I use this mixer for two reasons - home recording and live shows. The last thing I want to have is annoying distortion. Luckily for me I can turn down the gain knob all the way and still have the sound quite loud. 1. With the gain down all the way and the fader moved about 3/4ths of the way up produces crystal clear sound. I can’t emphasize how clean the sound is. 2. Once again with the gain turned all the way down, but with the fader moved all the way up, some distortion is noticed; not much though. The sound is still quite pleasant to the ears. 3. Surprisingly, when the gain setting is set to both the ¼ mark and the halfway mark with the fader 3/4ths of the way up, the sound is still not distorted. 4. When the gain is set to 3/4ths around there is some noticeable distortion. It is less than distortion than instance two, but it is still there. 5. Obviously when the gain is at full there is distortion, and can be annoying. Not much distortion still, but its enough to be a nuisance when trying to find “your sound”. I find that scenario 1 is your best choice and is really what emphasizes your sound. When all three equalizer knobs are set to zero the EQ is deactivated and the natural sound goes through. When they are changed though, they have a huge effect on the output. Fine tuning is quite easy with this EQ and is very useful. The low cut filter is another neat little feature that slopes at 16 dB/oct., -3dB at 75Hz and eliminates unwanted low-frequency signals. The FX feature is quite important. FX send allows you to drive external effects such as reverb, flanger, delay, etc. This allows the mix between the dry signal (unprocessed signal) and wet signal (processed signal with reverb, etc.) to remain at the level determined by the channel’s aux send, irrespective of the channel fader setting. 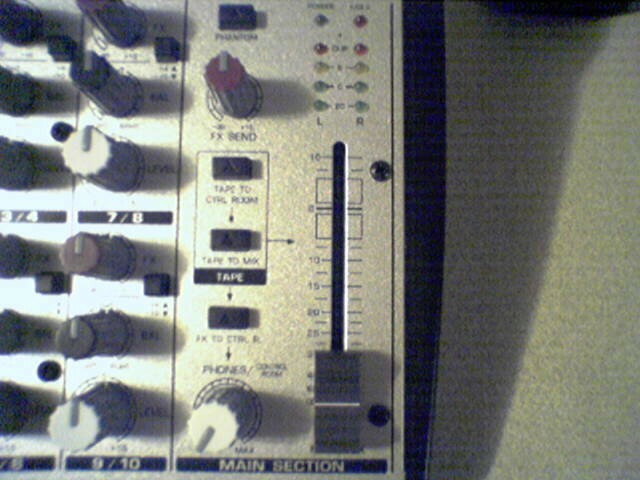 If this wasn’t the case, the wet signal of the channel would remain audible even if the fader is set at zero. Each FX send is mono and features up to +15 dB gain. The stereo channel FX send is similar to the FX send on the mono channels, but since the FX send buses are mono, a mono sum is first taken from the stereo input before it is sent to the FX bus. Pan’s job should be quite obvious. 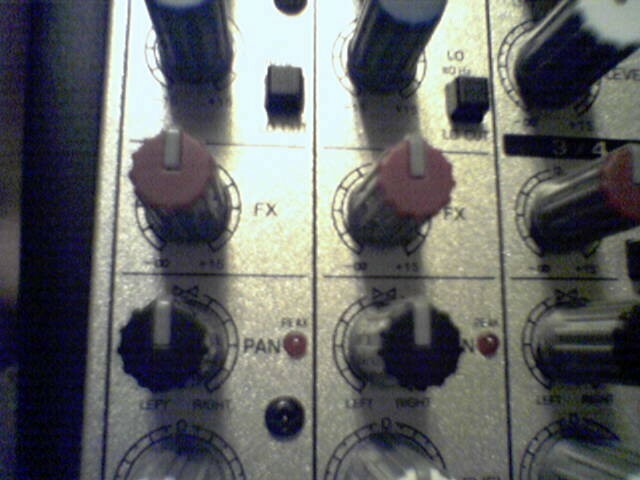 The pan knob determines the position of the output signal. 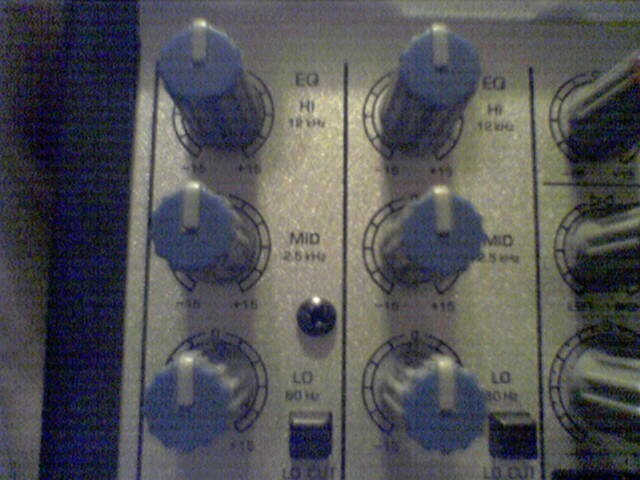 The signal is always maintained at a constant level, regardless of the position in the stereo pan. 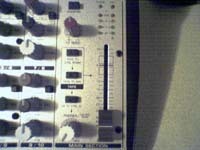 Pan is used on the mono channels. In a nutshell, it has the same job as the Pan control; it is just used on the stereo channels. Those are really the settings that I find are important enough to mention. I feel that the unit is extremely sturdy and can take quite a bit of punishment and still maintain a working order. 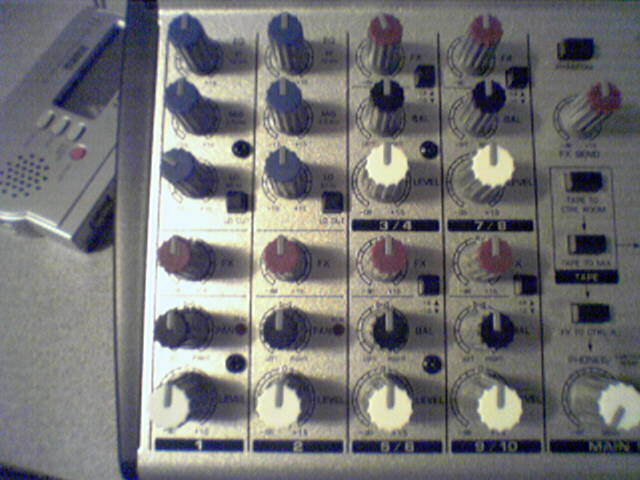 The placement of inputs and knobs seems well laid-out and everything is easy to reach without turning a knob accidentally. This is a great piece of work. It is very solid and can be taken everywhere without problems. The UB1002 is also incredibly quiet when it comes to distortion. It has a great set of features and a great on-board equalizer. There are only a few problems to be found. It would have been nice to have on-board effects such as reverb instead of using an aux. rack or pedal to have such effects. The second problem I have is that there is no on/off switch. That would have been very helpful, but it can be worked around. I still give this two happy thumbs up.